Oud has always been popular amongst perfumistas. It took me a while to get used to it myself. But how could I delay it? People love oud. Companies have entire lines of fragrances dedicated to oud. So how does Royal Oud stack up to the competition? Eh. In Bottle: It’s oud all right. Dense and warm oud with a flowery bit of woodsiness and a major spice going on. Applied: Okay, so here’s the problem with Royal Oud on me. It opens with a big spicy kick. Like the spices are a bit strong and overpowering at first and that makes it hard for my nose to adjust and get to the rest of the fragrance. As the spices settle down a bit, I get a warm, dense, slightly dirty oud and woodsy fragrance. The woods are a little distracting because I swear I smell a cedar note that’s threatening to take over and pull me away from the smooth richness of the oud fragrance. Royal Oud is a strange but rather boring creature. It’s strange in that it uses oud throughout its progression but the other notes in the fragrance seem to always be stronger and trying to overpower the oud. It’s boring because it smells like a spicy woodsy men’s fragrance with a little hint of dirtiness. Extra: Oud has this dirty, dense, very resinous quality to my nose. But to describe oud is nearly impossible because there are so many ouds and so many different ways that oud can smell. It can be dirty, dense, deep, warm, sweet, and sticky. It also all depends on what type of oud you’re smelling and whether it’s a synthetic or a natural oud. It’s a talented ingredient that takes a good perfume to the next level if used right. 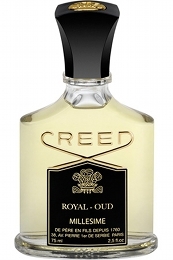 Design: The bottle itself is shaped and designed in a similar fashion to other Creed fragrances. Nice, heavy glass. Simple exterior with no unnecessary flourishes. The colors work well, the focus is on the fragrance and not the crazy gimmick bottle (here’s looking at you, Agonist. Even though I love Agonist bottles). It’s just a classic-looking Creed bottle that combines form and function very well. I don’t know how I should feel about Royal Oud except to say that Amouage did it better. Get yourself an attar if you want something that focuses a bit more on oud. Get yourself Royal Oud if you’re not sure you like the stuff yet but you want a confident fragrance that features oud but won’t overwhelm you with it. Reviewed in This Post: Royal Oud, 2011, Eau de Parfum. Creed’s gone tropical with Aventus but doesn’t dive in immediately into the fruity tropical pool. There are elements of sophistication still associated with Aventus. In Bottle: Fruity opening with a smoky leather background that has a certain earthiness to it too. Applied: Fruity, almost tropical and probably helped along in that direction thanks to the pineapple note. The opening smells rather familiar to a women’s fragrance actually with a deeper masculinity that comes up smelling mostly like fresh fruits and a bit of tar. Tar being that smoky–sometimes plastic–smell that I don’t particularly find enticing if not mixed well enough. Aventus does a good enough job of keeping it in check so that it enhances the fragrance for me instead of takes away from it. As the midstage wears on, there’s a little bit of floral but what I mostly get is this sharp earthy scent that dwells on in the fragrance way into the end where it fades with a bit of sweet vanilla. 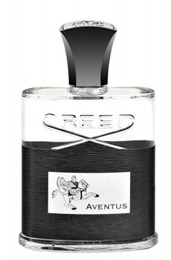 Extra: If you were afraid of other Creeds and those smelling a little too classic for you then Aventus is probably a good Creed starter. It’s got excellent projection and power but is an easy to wear fragrance. It is, however, a bit of a departure from how Creeds used to be. It is, nevertheless, still a competent fragrance. Design: Bottle design is similar to other Creed bottles. The niche houses tend to keep their designs fairly uniform and Creed’s not much different in practice. The bottle has a nice weight and is easy to hold and use. It also looks quite sharp with its clear glass elements combined with the black and metal treatments. Notes: Bergamot, blackcurrant, apple, pineapple, jasmine, rose, birch, patchouli, musk, oak moss, amber, vanilla. I’m not that big of a fan of Aventus on my own skin but it is a funny fragrance that starts off a bit feminine then nosedives right into a masculine scent. It’s playful then sophisticated at the same time. Reviewed in This Post: Aventus, 2011, Eau de Parfum. I’m rather sad that so many fragrances that are both beautiful and complex are discontinued. This includes Creed’s classic, Angelique Encens. 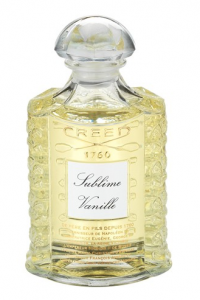 In Bottle: Creamy tuberose as a minor note–a bit of a surprise for me since tuberose tends to be big with my nose. There’s a lovely heady layer of incense hovering all over this fragrance. Applied: Tuberose and soft florals with a touch of vanilla and amber. The oriental portion of this fragrance is very noticeable at first but the scent ages into its mid-stage with a lovely incense note coming up and flooding the fragrance. The incense in this is so pure and beautiful that if you enjoy incense, you should definitely look this one up. It’s heady and full and blends beautifully with the amber and vanilla opening. There’s a bit of tuberose still lingering around with a perfumy jasmine note trying to make an appearance but only manages a minor cameo. Though you don’t get much of the opening as soon as Angelique Encens gets started, you do feel that they’re still there. The dry down is more incense with a complete fade of any florals that may have managed to peek through. Angelique Encens is just a pretty classic. Extra: All right, I got my sample of Angelique Encens dated to approximately 1970s but I can’t be sure as to how old it is. My contact also has no idea how old it is so we agreed on a very vague date for this stuff. The problem with Angelique Encens is that it’s no longer available. Creed discontinued her at some point and are now releasing her on a limited basis. Incredibly frustrating, but I suppose that’s how the exclusivity game works. Design: Angellique Encens is bottled in Creed’s signature flacon. I’ve held exactly one of these in my life and the feel was very nice. It was heavy and looked beautiful. The price gets me a little but Creed makes up for the price in packaging and, in the case of Angelique Encens, the juice is fabulous as well. Notes: Angelica, tuberose, rose, jasmine, amber, vanilla, incense. I wish they’d bring this one back from discontinuation. I think she’s deeper, more complex and far better than most of the Creeds out now. Reviewed in This Post: Angelique Encens, ~1970, Eau de Parfum. Zest Mandarine Pamplemousse is the grapefruit scent that should have been. It ranks up there with my other favorite grapefruit fragrance; Guerlain’s Aqua Allegoria Pamplelune as a well done, citrus-heavy scent. In Bottle: Light, slightly sweet and lovely bit of tart and sharp grapefruit cutting through the mandarin. There’s a very flowery and clean aura about this fragrance that’s also quite nice. Applied: Fresh and clean, like a really good citrus soap. As stated, there’s a hint of sweetness lent by the mandarin note that helps out the grapefruit to take it away from too sharp and too tart. The fragrances really do complement one another and I love how well blended and sheer this is. Zest Mandarine Pamplemousse is not a heavy hitting fragrance. It’s light, airy, and not at all heavy-handed. I’ve become quite a fan of the understated scent and there’s a charm to this one that helps me get over how short-lived it is. Zest Mandarine Pamplemousse goes into its mid-stage with a pleasant white floral and woodsy pairing that helps carry the scent out of the citrus opening and into the end stage where most of the fragrance complexity falls off into a very light woodsy scent. Extra: Zest Mandarine Pamplemousse is a very weak, very short-lived fragrance. A lot of citrus heavy perfumes tend to be like this so if you are looking at a citrus scent that’ll cling to you forever, Zest Mandarine Pamplemousse is probably not up your alley. If you want a light, very sheer, very clean fragrance, this one will do the job. 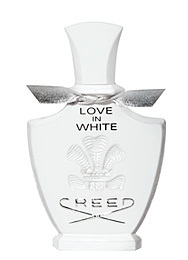 Design: Designed much like every other Creed fragrance bottle. I still like the heft of the bottle but wish the design was something a little more luxe looking. Especially given the cost of admission that Creed wants to charge for these things. Zest Mandarine Pamplemousse’s bottle is a clear glass with a greyish-white cap. Notes: Bergamot, mandarin, grapefruit, white florals, ambergris. Between Zest Mandarine Pamplemousse and Guerlain’s Pamplelune, I’m going to have to concede Zest Mandarine Pamplemousse as the winner. It’s cleaner, more to my taste, and goes down much smoother too. Reviewed in This Post: Zest Mandarine Pamplemousse, 2009, Eau de Toilette. 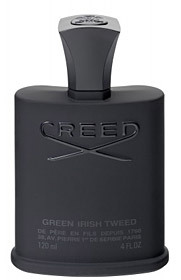 Quite possibly Creed’s bestselling fragrance, Green Irish Tweed is a little diddy released in 1985. It has steadily remained popular since its introduction and has spawned a number of copycats. Including the often compared, Cool Water by Davidoff. In Bottle: Green and clean citrus note up top. It’s just a touch sweet with a lingering background woodsiness to it that makes this smell very masculine from the get go. Applied: Nicely charming opening with a strong green lemon verbena touched with a sweet clean note to sooth the opening a bit. As Green Irish Tweed starts to dry down, the mid-stage introduces a very pleasant wet and clean quality to it. There’s a violet leaf, iris and slightly bitter ivy scent floating around in here too with a soft woodsiness lingering throughout. The mid-stage is my favorite part. It’s dry down is a bit formulaic with the sandalwood amping up partnered with a really glorious amber note which helps take the fragrance away with it. Green Irish Tweed a sophisticated piece of men’s fragrance though it’s sometimes hard to give Green Irish Tweed its credit because it has spawned a lot of similar fragrances. So many, in fact, that people may have gotten bored of it. Extra: This fragrance has been described a great deal of ways, from people saying it smells like boring, over expensive trash or the epitome of men’s fragrances. For me, personally, I like Green Irish Tweed. I can’t wear it because it’s such a recognizable fragrance that’s been so well ingrained as a men’s fragrance. That’s not to say a woman can’t rock with Green Irish Tweed on her. I just prefer to leave this one for the men. Design: Green Irish Tweed is most recognizable bottled in an all black glass bottle that’s shaped like all the other iconic Creed fragrances for men. I do not own a bottle of Green Irish Tweed but I have held one and it, like other Creed bottles, has a nice weighty feel to it with a good shape that’s easy to hold and spray. Notes: French verbena, Florentine iris, violet leaves, Mysore sandalwood, ambergris. 1. If it’s too cheap to be true then it probably is. 2. Always scrutinize the seller for more details, more pictures, and don’t be afraid to ask questions. 3. Always try to buy from a seller who will offer full refunds on products sold. 4. Check their feedback. All of their feedback. 5. Pay attention to what the bottle and packaging looks like. Anything out of the ordinary should sound off alarm bells. 6. If the scent is weak, different, or doesn’t last then it could be fake. 7. Don’t be afraid to ask other people who might be able to identify if your fragrance is real or fake. Include pictures to make it easier for us to help you. Reviewed in This Post: Green Irish Tweed, 2009, Sampler Vial. 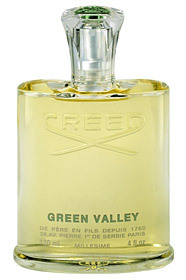 Creed’s Green Valley is the feminine answer to Creed’s enigmatic Green Irish Tweed. The softer, gentler, more girly fragrance is supposed to be a similar treatment. I don’t see the similarities, unfortunately. In Bottle: Sweet aqueous scent with a fruity note further adding sweetness to the water. This has the sweet water treatment that I smell in similar feminine aqua scents. Including Bath and Body Work’s Dancing Waters. Obviously Green Valley is several steps above Dancing Waters in complexity and beauty. Applied: More sweet water, slightly green note in the opening. Sweetness come up with the violet leaf as a very pleasant blackcurrant note. Unfortunately, as Green Valley starts to dry down, it falls apart. I seem to be having a spat with lemon notes as the lemon in this fragrance throws everything off as it comes in, tips its hat and proceeds to become the biggest thing in the fragrance, overtaking everything and throwing its weight around to the point where all I smell is unbearably sharp lemon. Once in a while, I can get a safe whiff of what Green Valley was, smooth, sweet, watery and blackcurrant. But the lemon will come in immediately after and exert its massive influence. It’s a shame too as this gigantic lemon will stick around until the dry-down phase where it fades to nothing just before the pleasant woodsy base disappears too. Extra: I certainly don’t get the Green Irish Tweed tie-in. And it isn’t just me and my feud with the lemon note either. Green Irish Tweed is in a different class than this. If you want to smell like Green Irish Tweed, why not just get Green Irish Tweed? Or the knock-off version, Cool Water. Design: Bottled in much the same way as other Creed fragrances. This bottle is in a clear glass with a clear cap. Nothing spectacular about it with regards to the design elements though Creeds are fairly well packaged in some lovely and quality material. Notes: : Mandarine, bergamot, ginger, lemon, black currant, ambergris, musk. I’m thinking I should stay away from anything with lemon in it. But just this one particular lemon used in some fragrances that ends up ruining the whole deal. I seem to be fine with the lemon in Pure and Nina. This stupid gigantic lemon, however, has so far ruined Green Valley, Versense, Light Blue, and Covet. Reviewed in This Post: Green Valley, 2009, Sample Vial. Love in White is one of those fragrances with a wide split between people who love it and people who hate it. It’s Creed’s answer to the ultimate fresh fragrance. This stuff is so fresh and crisp it makes my eyes water. Billed as a women’s fragrance, Love in White comes in a cute, feminine white bottle that’s supposed to represent a woman, the sand, and the sea. I can dig it. In Bottle: Sweetness, aqua, and something sharp. Like sugar water with broken bits of glass and twisted pieces of metal. Love in White is strong too. So strong that my first whiff of it went straight up my nose and exploded in the back of my head. The sharpness that I assume might be the zest is so strong in this that it went beyond fine fragrance and reminded me of household cleaner. Applied: Not much dying down of that sharp note on application but I do get the rest of the fragrance now that it’s on my skin. It’s like somebody turned up the volume on the jasmine note here because it’s very high-pitched, almost shrill as it tries to out sing the sandalwood. Meanwhile, iris with its rather distinct brightness is adding to the fresh feel. There’s got to be some aqua note in this because I swear I can smell water. I suppose that’s where the ocean imagery comes from but so much of this fragrance is clean and fresh that it’s hard to move beyond those two concepts to something gentler. The dry down helps a bit, the sharpness fades and the florals have sore throats and are now just whispering. I can appreciate the quiet calm of the dry down here as the soft creaminess of that vanilla shows up to help tame the sandalwood a little. Extra: Love in White kind of reminds me of household cleaners. Not in a bad way. I mean, household cleaners contain fragrances meant to offend the least amount of people. Love in White is that inoffensive. The thing I can fault it for is how close it has to stick to my skin so I have to get up really close and personal. And when I’m that close, the fragrance is incredibly strong. Design: The white bottle for Love in White is supposed to represent the feminine, the ocean and the crisp ocean air. I’m not sure I’m really feeling the look of the bottle or the conceptualization of it but it is pleasant enough to look at. Notes: Orange zest, rice husk, iris, jasmine, daffodil, magnolia, rose, vanilla, ambergris, Mysore sandalwood. When it’s all said and done Love in White is a very fresh sort of shrill scent with a loud projection that also manages to stick relatively close to the skin. I have to get up close to really smell it but once I’m that close I also tend to get its entire assault up my nose. Reviewed in This Post: Love in White, 2010, Sample vial. In Bottle: Rummy coconut and crisp lime. The rum note is getting a lot of help from the alcohol base of Virgin Island Water, and making the scent a tad more authentic. 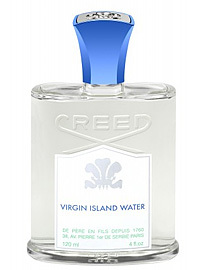 Virgin Island Water is a clear, crisp, clean fragrance with a slightly floral, gingery treatment. Applied: The rum is up front and center then steps aside for the coconut and lime. Many people have noted the similarity between Virgin Island Water and Bath and Body Works’ Coconut Lime Verbena. I don’t blame them, it was the first thing I thought when I smelled this too. But there’s subtle differences between the two. The most prominent one being that Coconut Lime Verbena is a much simpler fragrance with less boozy personality than Virgin Island Water. The latter has a crisper, greener lime note, a less aggressive coconut note and then there’s that rum which Coconut Lime Verbena lacks. In addition to the rum and the purity of the lime and coconut, Virgin Island Water also has an interesting evolution where its Bath and Body Works counterpart tends to stay one-dimensional. As the scent ages, the ginger comes up, spicing up the fragrance and giving it a more exotic feel. Hibiscus and jasmine also help separate Virgin Island Water and add sophistication to the scent as the dry down starts showing off a bit of flower power. The only thing I can’t say for Virgin Island Water is its lackluster staying power as I approached dry down within a few hours. At least dry down was beautiful as a crystal clear, rich coconut rum fragrance. Extra: Creed is a fragrance house that began sometime in 1760 in London by James Henry Creed and is still run by the family today by Oliver Creed. There is some speculation as to some of their former clientele, but I’m not much of a Creed history buff nor does it affect the fact that I like the fragrances they put out so they’re doing something right because they have a lot of fans. Design: Most Creed fragrances come in similar bottles. I have a sample vial straight from Creed itself that’s just a generic glass vial filled with the good stuff. There are glass flacons and spray bottles available that tend to look the same depending upon the fragrance gender. I’ve never held nor seen a Creed bottle in person so I cannot attest to the quality of the packaging. I can say that I’m not much of a fan of the pretty plain looking spray bottles but the splash flacons look elegant and functional. Notes: Bergamot, lime, mandarin, coconut, copra, jasmine, hibiscus, ylang-ylang, ginger, tonkin, rum, sugar cane. So it comes down to one question. Is it worth it to shell out the hundred-something bucks for a bottle of Virgin Island Water when most people wouldn’t be able to tell the difference between the hundred dollar juice and the ten dollar juice from Bath and Body Works? Try them both out first. Perfume is a personal experience and not everyone’s nose can detect every note in a fragrance. If you can tell the difference between the two and like Virgin Island Water more, then buy it if you feel it’s worth it. If you can’t tell the difference and like them both just fine, it’s probably better to get Coconut Lime Verbena and save yourself quite a bit of money. Reviewed in This Post: Virgin Island Water, 2010, Sample vial.